This 7ft x 5ft Select Tongue and Groove Apex Shed features a traditional design with a spacious interior. The shed is constructed using high-quality tongue and groove timber; the strong cladding makes this building ideal for larger or more valuable items. The floor of this building is made from a hard wearing, solid sheet material, for a sturdy storage area. This building is perfect for keeping tools, lawn mowers, barbecues, and furniture secure and can be fitted with a pad bolt (not supplied) so you can keep your items safe. This building also features styrene glazed windows, a safer and environmentally friendly alternative to glass. The roof of this building comes with high quality, mineral felt; protecting your building from winter weather. 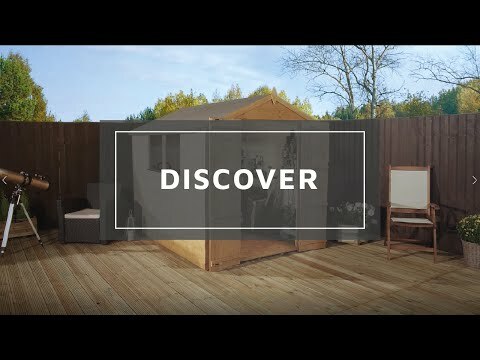 If you want a strong garden building that is both functional and value for money, this shed is ideal and will last for years to come. Review:Choosen this based on the reviews. Our Reply:Thank you for leaving feedback regarding your recent purchase.it is really good to know that you are pleased with your purchase. Our Reply:Good morningThank you for your feedback. We are so glad that you are pleased with purchase. Our Reply:Good morningThank you for taking the time today to leave us your feedback. We take all comments seriously and thank you for yours. I am pleased that you were happy with the Shed once erected. I am glad that you are happy with your tongue and groove shed overall and we take your comments on board as we are always looking for areas in which we can improve. Thank you again for your positive review! It is always lovely to hear from repeat customers and I am glad that clear instructions led to a straight forward assembly and that you are very happy with your tongue and groove shed. Thank you for your positive feedback. I am pleased that you are happy with the quality of your tongue and groove shed and that clear instructions led to a straight forward assembly. Thank you again for your feedback. Review:Great product. Nothing wrong at all. I am delighted to know that you are so happy with the quality of your tongue and groove shed and I thank you again for your wonderful feedback! Review:Great product well built fit perfectly in my little garden. It is fantastic that you are very pleased with the quality of your tongue and groove shed and that it suits your needs perfectly. Thank you once again for your positive review! Review:EXCELLENT VERY GOOD VALUE FOR MONEY! WENT UP REALLY WELL AND GOOD QUALITY PRODUCT - CLIENT WAS VERY HAPPY! I am thrilled to know that you are very happy with the quality and value for money of your tongue and groove shed. It is also great to know that assembly was straight forward and I thank you again for your positive feedback. I am pleased to know that you are happy with the service and value for money and I thank you for your positive feedback. Review:Looks nice now up but not great quality i.e roof, floor and roof felt all very thin. Review:Good product but floor base let it down badly. Far too flimsy and thin. Very disappointed. Our Reply:Good morning,I am thrilled to know that you are happy with both the service we provided and the quality of your tongue and groove shed. Thank you for taking the time to offer your feedback! Our Reply:It is wonderful to know you are happy with the quality of your tongue and groove shed, our efficient delivery driver and that you would be happy to recommend Waltons to others. Thank you again for your great feedback. Review:Quality of materials good. Shed erected in a timely manner with clear instructions. Only one issue, two pieces were missing. Bracket for roof hanger and one window wood strip.Fortunately I was able to fashion these items myself. Would recommend your products. Review:One problem was window. Instructions for window very poor and window assembly/design very flimsy. Needed to build support for window. Our Reply:The floor is as standard for the building and offers adequate support, however we do offer the option of a floor support kit for our customers that require added strength. Our Reply:It is always good to know that you are happy with your shed and we take all our customers comments on board and thank you for your feedback!